We have a pop quiz today, dearest readers! Ready? First question: What is the title of the vintage University of Illinois student-made feature that will be given a second shot at domestic distribution by Vinegar Syndrome later this year? We revealed the answer, SHOT, in our post from last week. Second question: When did UIUC students publish the first issue of their film journal MacGuffin? It made its campus debut the very same day as SHOT back in March 1973 as recounted in our recent Confidential Almanac entry. Third and final question: Who are the undergraduates today filling the shoes of those who once acted upon their own interests to examine the art of cinema while schooling in Urbana, and how do we discover their doings? Why, keep reading this passage and you will learn about three opportunities taking place in the next week at which students will showcase contemporary shorts created by their peers from near and far, far away! The first event is scheduled for tonight, Wednesday, April 25, as the UI Women’s Resources Center stages their ninth Feminist Film Festival at a new venue, the auditorium of Lincoln Hall. Filling in for departed guiding light Rachel Storm, who now works for the city of Urbana, interim WRC assistant director Sylwia Dutka and her volunteers will continue the show’s valuable outreach by presenting a set of works by current employees and enrolled students at UIUC that use unique voices and potent storytelling to tackle aspects of feminism and social justice in the current climate. A catered reception will begin at 7 p.m., providing audience members a chance to mingle with the evening’s filmmakers before the program begins. 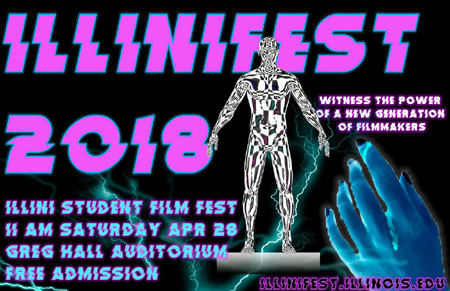 On Saturday, April 28, the next collection of film shorts will be displayed in the auditorium of neighboring Gregory Hall as part of the fourth Illinifest Student Film Festival, organized by the classmates of the Media and Cinema Studies (MACS) 464 course taught by Dora Valkanova. They have curated more than 30 movie projects to share, split between those made by students from Midwest academia including Illinois (“Midwest Student” category) and others welcomed from across the globe (“World Competition” category). They will also facilitate two panels, one on sexual harassment in the media industry and another on emerging distribution platforms, populated by faculty and professionals with careers pertinent to the topics. You can become familiar with the films as well as a surprisingly seasoned roster of guests, including the judging panel, at their Web site. Doors open at 10:30 a.m. and activities will run all day long. Finally, the long-running Illini Film & Video club will partner with fellow RSO Photon Pictures to present the UI student body with a sampling of their best pieces. Their event collaboration, the Golden Corn Film Festival, will put on an “old Hollywood” air at the Lincoln Hall auditorium on next Wednesday, May 2, with doors opening at 6 p.m. and videos projecting from 6:30 p.m. on. Graduate student Rachel Berry and the rest of the IFV and PP board members are not only planning a big show with 13 shorts produced between the clubs, but they’re also cooking up goodies for a “movie-themed bake sale” to help cover Golden Corn costs; go find them on the UI Main Quad tomorrow, Thursday, April 26, between 9 a.m. and 3 p.m. to show your support for their show. Yum! Admission is free for all programs. This entry was posted on Wednesday, April 25th, 2018 at 12:00 pm	and is filed under Area Festivals, Education/Classes, Public Events, Student Film. You can follow any responses to this entry through the RSS 2.0 feed. Both comments and pings are currently closed.